Several people have commented on my “drawing skills”. I always like to be honest with my readers. My drawing skills are not particularly good but you have to work with what you’ve got. While the design is mine I used a photograph as the basis for it. Here’s how I did it. 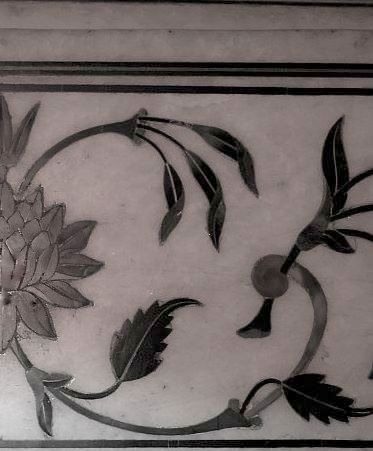 I photocopied a photo of a piece of marble work from the Taj Mahal – this was a lily and two tendrils with serrated leaves and some long leaves and buds coming from the top of the lily. With a “Sharpie” I drew over the photograph. I changed the shape, size and number of the leaves. I changed the shape, size and number of the petals making them larger and simplifying the flower. Then I removed the top leaves and buds. I traced the “Sharpie” lines onto a blank piece of paper. Then I moved the “Sharpie” design around underneath the paper until I had the tendrils in different places and I traced over them again. I did this several times, as you can see I have many tendrils. So this is how I made my design. It isn’t the same as the original. In fact it isn’t anywhere near as beautiful or delicate as the original. 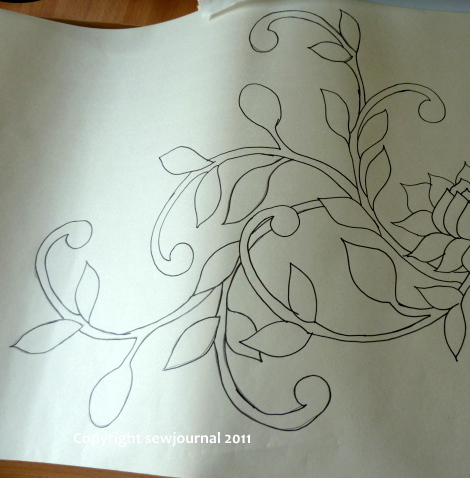 My flower is much less detailed and more caricatured, my leaves are different in size, shape and number, as are the number and placement of the tendrils. Working this way allows me to have a skeleton to work with and to put my meagre drawing skills to work on top of some nice “bones” which were provided by a master marble worker many centuries ago. Well done Munaiba, a good way to find a base for your own imagination. This design is hundreds of years old. It is no different than using a Roman mosaic or a Greek marble floor as the basis of a pattern. What’s more I believe I have changed it significantly. In addition I’m not planning to sell this, it is just for my own use. There are many quilts out there based on Islamic Arabesque designs. Turkish tiles, Roman tiles, Greek floors and more. Most graphic designers have “source books” they use as the basis of their designs. If I had copied it exactly and if it had been drawn by someone who was alive and if I was selling this as an original pattern then I think you would be right. I think all I’m doing is giving myself a helping hand with the bare bones which I can then embellish. Thanks for asking the question though. Verrry crafty, Munaiba! I like the thought process that goes into it. I wouldn’t think there would be any copyright problems with something that is hundreds, if not thousands, of years old. I can’t wait to see it progressing. Aaahh, I think that’s very clever! I for one would not have thought of it but I am learning to look at things differently and grow in my own quilt journey! Thanks for sharing these details, Munaiba! Wonderful job! I’ve done similar work but using my computer & drawing programs but I’ve never done anything as complex. You’ve inspired me to do more than reshape & slightly modify. I love the way you created the tendrils. love what you have done. Great way to start your design process. Thanks I will have to remember this method when I am working on my designs.